Growers, researchers, policymakers and others can now pinpoint California's most promising parcels of farmland to help replenish the state's dwindling groundwater supplies, thanks to a new interactive map developed by the California Soil Resource Lab at the University of California, Davis. 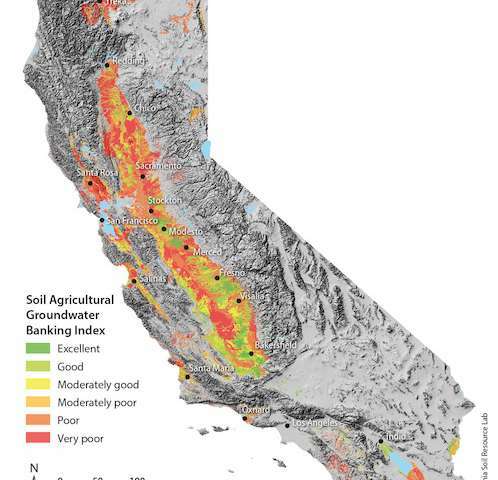 The Soil Agricultural Groundwater Banking Index provides site-specific information on millions of acres of California farmland based on previous research led by Toby O'Geen, a UC Cooperative Extension specialist with the UC Davis Department of Land, Air and Water Resources. Before designing the Web-based map, O'Geen and his team identified about 3.6 million acres of farmland with good potential for groundwater banking, based on how likely the land could accommodate deep percolation with little risk of crop damage or groundwater contamination. "A lot of growers are interested in learning how they can help improve the groundwater situation in California," O'Geen said. "The index provides details on the groundwater-recharge potential for any parcel, which you can search for by address or access using your device's GPS." If a much-anticipated El Niño arrives this winter, California's vast acres of farmland may hold the key to groundwater recharge by absorbing rainfall and flood flows. "During storms and flood-control releases, excess river water could be routed through irrigation canals onto farms, where the surplus would seep underground to replenish groundwater," said Professor Helen Dahlke with the UC Davis Department of Land, Air and Water Resources. "On-farm flooding could also mitigate downstream flood risks." "Adding an extra few feet of water to even just 10 percent of California's cropland this winter could add an additional 3 million acre-feet of groundwater," Dahlke said. "That could go a long way toward replenishing the 6 million acre-feet growers had to pump this year alone to cope with California's drought."